My 10-Day Ballet Challenge | Finding delight. I’m so excited to share this workout challenge with you guys! As I’ve talked about before on this blog, I’ve LOVED participating in various 30-day yoga challenges over the last couple years. 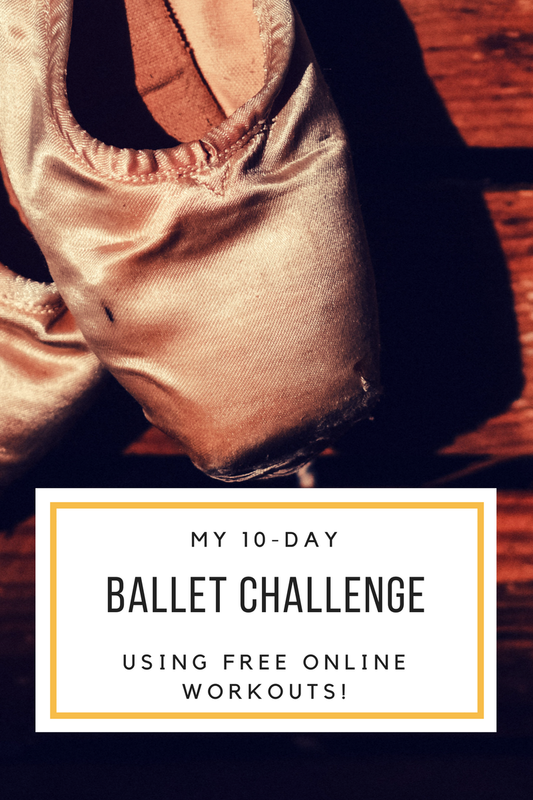 I thought it might be fun to make a challenge of my own (using free online workouts of course) for another type of exercise I quite enjoy — BALLET! It might sound strange, but those yoga challenges bring me a lot of joy. a) I don’t have to think about what workout to complete on any given day. Anti-decision fatigue SCORE! b) Committing to something for a specified period of time, even to myself, means I’m way more likely to follow through. c) The results are usually pretty nice. 🙂 d) I love that yummy feeling you get after completing a challenge you set for yourself. And there you have it! I’ll definitely let you know how it goes…Until then, WISH ME LUCK! Have you ever done a workout challenge like this one (or the Yoga with Adriene 30 day challenges)? Love ’em or hate ’em? How do you stay motivated to exercise? Let me know! This is so awesome! I love all the workout challenges I’ve been seeing through social media – gets people so awesome and inspired. I’ve never actually done ballet before. I don’t think my feet are actually capable of moving the way they’re supposed to. I’m far from elegant! Haha. This is going to be quite a fun challenge! I bet you’ll walk away with a lot of new skills too. I think this is a great idea. Hmmm…never tried a ballet challenge. Sounds like you created a great workout for yourself 🙂 I’m old school and still like step aerobics…lol. Thank you so much for sharing this! I am always looking for new challenges for my girls to work on. I coach a competitive gymnastics team and this is right up there alley. Can’t wait to share it with them next week! How cool! I think they would find it fun/useful. Let me share this with my daughter. Learning to dance the ballet was her biggest dream as a child. We could not afford ballet lessons back in the day. So maybe now, even if she is an adult (and a mommy herself), she can get a feel of how it is to learn to dance the ballet and get a workout as well. Pingback: How to Make Your Own Fitness Challenge | Finding delight. Hey this looks like a lot of fun. Will definitely give it a try and tell you how it went. How much fun! I was a ballerina through college and used to love this stuff. Pingback: 30 Days of Ballet Training | Finding delight. Pingback: A 12 Day Workout Challenge (Inspired by Social Media Favorites!!) | Finding delight. Pingback: The “All You Need is a Clock” Workout | Finding delight.